The National Institutes of Health Institutional Development Award (IDeA) program broadens the geographic distribution of NIH funding for biomedical research. The program fosters health-related research and enhances the competitiveness of investigators at institutions located in states in which the aggregate success rate for applications to NIH has historically been low. The program also serves unique populations such as rural and medically underserved communities in these states. The IDeA program increases the competitiveness of investigators by supporting faculty development and research infrastructure at institutions in 23 states and Puerto Rico. Alabama is NOT currently eligible for the NIH IDeA program. 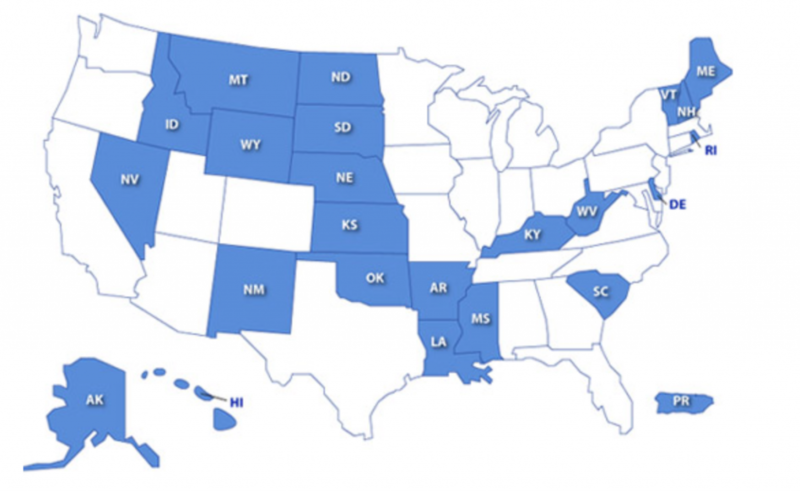 States in blue are eligible for NIH IDeA. Centers for Biomedical Research Excellence (COBRE): designed to augment and strengthen institutional biomedical research capabilities by expanding and developing biomedical faculty research capabilities through the support of a multidisciplinary center led by a peer-reviewed, NIH-funded investigator with expertise central to the theme of the grant proposal. IDeA Networks of Biomedical Research Excellence (INBRE): designed to enhance the biomedical research capacity, expand and strengthen the research capabilities of biomedical faculty, and provide access to biomedical resources for undergraduate students throughout eligible states. The INBRE program enhances the research infrastructure by supporting a statewide system of institutions with a multidisciplinary, thematic scientific focus. This and additional information about the NIH IDeA program can be found here.